Convention includes testimonies, updates on projects, and a recommitment to serve. 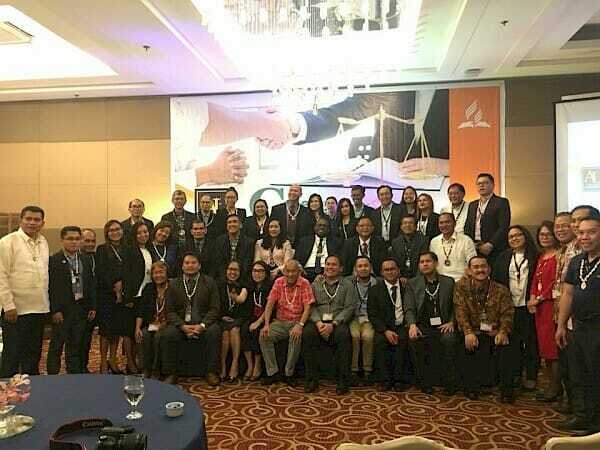 Dozens of Seventh-day Adventist lawyers, law professionals, and law students met for a weekend of testimonies, updates on outreach projects, and a recommitment to serve in church mission at the second annual Adventist Lawyers’ Convention, which met in Cebu City, Philippines, August 23-25, 2018. Under the theme “Called and Committed to Serve,” they tackled topics to better support the mission of the church and promote church leadership. “Adventist lawyers take the divine mandate to proclaim the everlasting gospel to the world seriously,” organizers said. “And they show full support to the Total Member Involvement initiative of the world church.” Total Member Involvement, or TMI, looks to involve every church member in sharing Jesus with friends and neighbors. During the Sabbath (Saturday) morning service, several lawyers shared testimonies about how they believe God answered their prayers. Triven Pesigan Castillo told how he feels God helped him to finance the construction of his local church school. “If God provided a ram for Abraham, I believed He would provide a ram for me,” he said, in a nod to Abraham’s experience recorded in Genesis 22. “And He did, but I didn’t expect God would give me a bigger and heavier ram.” On the first day of the year, Castillo specifically asked God to give him the privilege of returning a six-figure tithe. “And I believe God answered my prayer,” Castillo said. Herculano Tagalugin reported on the active participation of Adventist lawyers in evangelism in General Santos City. Tagalugin leads the local radio program Tingog sa Paglaum (“Voice of Hope”), which has been running for 16 years and has overseen the planting of 18 new churches in the Southern Mindanao Mission church territory. He mentioned Chalmer Gevieso, an Adventist judge who has been active in conducting evangelistic meetings, and the participation of another Adventist judge, Jimmy Boco, in broadcast ministry. Boco’s “Is It Biblical? Is It Legal?” program is regularly aired over the radio, on television, and on social media. Lei-Maurae Estrella-Babatuan recalled how she felt God by her side in difficult times as a public attorney, as she handles almost 50 cases a day. “Since I was a law student, I have taken comfort and encouragement from the Bible, especially in Psalm 23:4,” she said. Another lawyer, Silvino L. Sumagaysay Jr., reported on his participation in evangelistic meetings across the North Philippine Union territory, and even in India, where he has led many people to baptism. At the same time, Harlin Abayon reported on what he called “two recent victories for the church” — the renewal of the Hope Channel Philippines’ franchise to operate for another 25 years, and the recent Supreme Court ruling on Denmark Valmores, a faithful Seventh-day Adventist who stood true to his religious conviction. The Supreme Court ruling provides jurisprudence on religious accommodation for the first time in the history of the Seventh-day Adventist Church in the Philippines. “I challenge every lawyer present here to stay committed and help the church, because time is running out,” Abayon said. Seventh-day Adventist Church associate general counsel Josue Pierre attended the convention and presented a global view of legal issues and the work of the church. Several leaders from the Southern Asia-Pacific (SSD) church region also attended the event, as well as leaders and pastors from the three Union church regions of the Philippines and two Union regions in Indonesia.